PHOTO: Allen Ramsey, DWCPhoto.com. 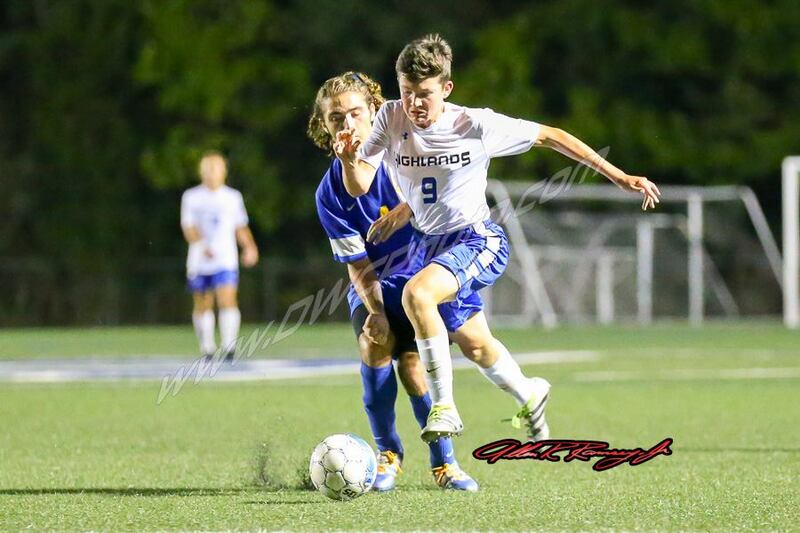 Highlands junior Blake Shuley (9) makes his move in the game Thursday against Newport Central Catholic. The Bluebirds won 1-0 for their eighth straight win. The Highlands Bluebirds boys soccer team has shown how a tight bond helps immensely overcome adversity all season. It once again helped Highlands (11-1-2 overall) defeat the 36th District arch-rival Newport Central Catholic Thoroughbreds (9-5), 1-0 in another physical game. The Bluebirds also moved to 7-0-1 in 9th Region action with their eighth straight win and 10th shutout of the season. The game's lone goal came with 9:07 left in the contest. Highlands senior Parker Smith crashed the net on a shot on a rebound and scored his second goal of the season on a Bluebird corner kick. "It doesn't really matter to us who scores as long as it gets in there," said Solomon Farris, Highlands senior. "It's about the bond we have. The stats don't matter to us." NewCath entered the game fresh off a huge 1-0 win over Bishop Brossart on Tuesday in the 9th/10th Region All "A" Sectional Tournament game to qualify for its first All "A" State Tournament since 2011. But the Thoroughbreds did not suffer a letdown. Highlands outshot NewCath, 20-10 including 7-3 on goal. Thoroughbred goalkeeper Joel Grosser recorded six saves. On the other side, Highlands senior goalkeeper Paul Tully recorded two saves and senior goalkeeper Simon Frink had one. "It's always good to get a win against NCC," said Matthew Winkler, Highlands Head Coach. "It's a great rivalry between the two schools with a lot of talent on both teams. We knew we'd have to grind hard for sure. They were here with everything they could bring." Tully normally plays the first half at goalkeeper and Frink comes on in the second half. But Tully had to relieve Frink briefly in the second half when Frink picked up one of four Bluebird yellow cards. NewCath senior Justin Randle took a free kick just outside the 18-foot box, but Tully blocked it over the net. "I'm always ready to play. I love being out there," Tully said. "It definitely starts with setting the right wall then keeping your eye on the ball no matter how many people are in front of you or where it's going." Both teams had their chances. Highlands junior Nick Gish had two big opportunities including a one-on-one with Grosser with 11:40 left in the first half. But his shot hit off the right post. Another big opportunity for the Bluebirds came with 21:12 left in the game. Highlands sophomore Alex Ford recorded a steal in the attacking third. But Grosser blocked his shot. The Bluebirds could have had more scoring opportunities. But they received eight offside calls compared to none for the Thoroughbreds. Highlands committed 13 fouls to 10 for NewCath. The Thoroughbreds received two yellow cards. Winkler explained the three types of fouls are careless, reckless and excessive fouls. The first two draw the yellow caution card and the last one draws the red card. "Defense is the thing that keeps you in games and sometimes will help put you over that edge," Winkler said. "We really push hard to keep the clean sheet. Our back line is coming together. We have a couple more weeks to fine-tune some things. We should be ready on Oct. 11 to see (NewCath) again." The Bluebirds take on Covington Holy Cross at 11 a.m. on Saturday at Eva G. Farris Park in Covington. Winkler said Highlands will not make up the rained out game against North Oldham.